Morning, I’m late this morning overslept until 6 which I am sure is going to screw the whole day up but there you go. Couple of things before we get down to business. 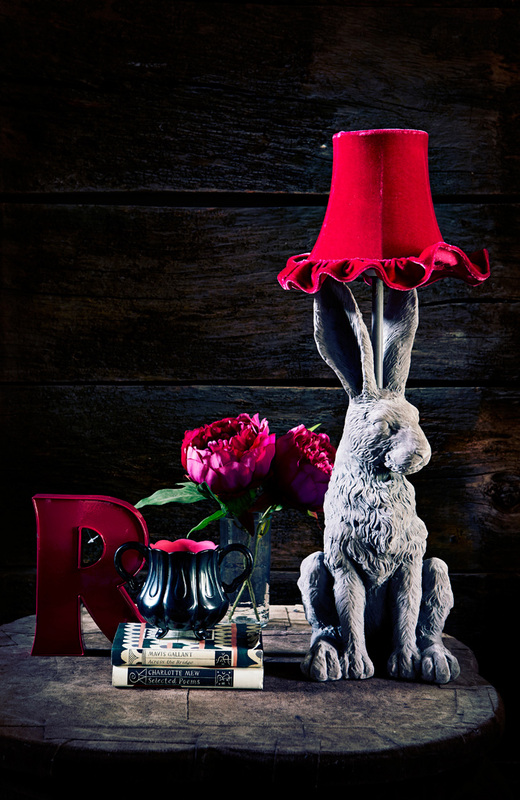 We have been a little inundated with requests about my hare lamp for Debenhams (as seen below) as he has gone out of stock again. We have all been rather blown away with the demand,Â to know that he has been the number one seller in the whole of lighting since being launched is pretty incredible. Big thank you to everyone who has brought him and all the other products. I know lots of you are thinking of him for presents so I just wanted to say that 500 pieces arrive at the end of this week so should be in stores and on line the week after. As its such a small batch and its being distributed to over a 100 stores if you are thinking of him as a present I would recommend getting him when this new batch comes in. As soon as he is back in I will let you guys know. On a different note a big thank you to everyone who came to Saturdays design class I had such fun, you guys were fab – felt like inviting everyone to hang out for the rest of the evening,Â I so didn’t want it to end! Yesterday for us was a pottering kind of day, stroll for breakfast along the canal and to the park with the two M’s, a tidy up of the house, spot of gardening that kind of stuff and then before you know it Monday rolls on around and its back to business. My sister got his really cool rug from Ikea a while back, it cost around Â£30. Bargin! I should mention that generally I endorse going for some sort of motif with the rug since pattern no matter how small enlivens rooms like nothing else I know. 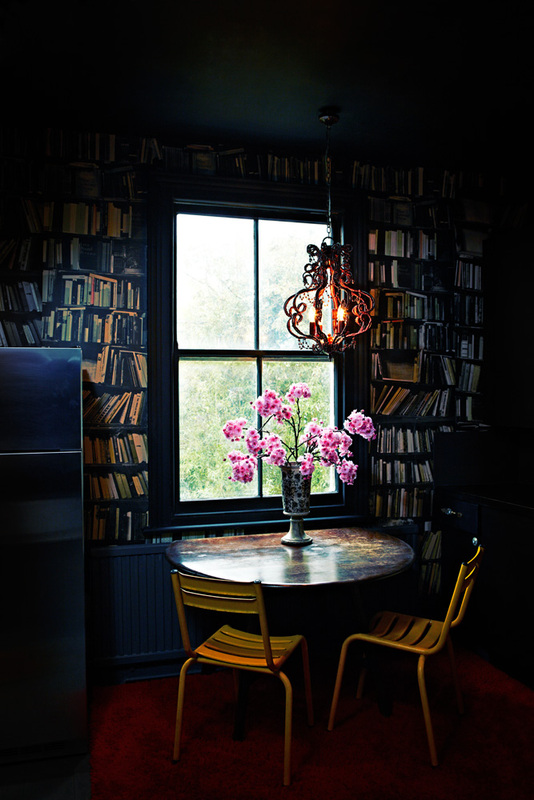 However in Gem’s case when she has this highly patterned wallpaper not so far away a solid colour works so well. Even better that its a vibrant hue – if you went pale (who knows why you might) it just wouldn’t have the same impact. Its pretty tough to see I realise but trust me it looks fabulous! This rug below (Jasper Grey Rug) comes from Crate and Barrel a US site which ships to the UK and is priced between Â£41 and Â£246 depending on the size. Ignore the styling if you can, the room feels a little uptight I know but see how pattern even if you are only using a limited palette brings a room alive. This runner (maya dhurrie runner) below is also from a US site CB2 and is priced at Â£52. The reason I wanted to show you this is to illustrate you don’t always need some great big thing floating across the floor, a runner works just as well and is super easy on the budget. 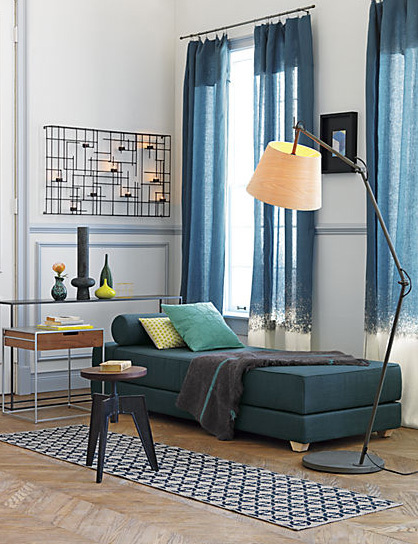 If you don’t have much pattern going on in your room add it through a rug it will elevate it, knock it out of the park. lift the spirits that sort of thing! 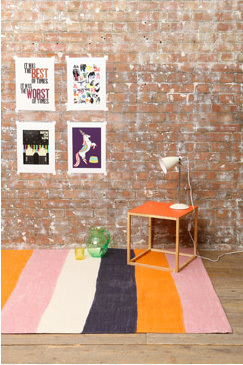 Finally this rug (Striped Ashley) is from Urban Outfitters and priced at Â£69! So there you have it. Style has got nothing to do with money and everything to do with having an eye! Of course flea markets, auction houses, gum tree and preloved are other great resources that are worth checking out if you have a bit of time. Before I go I want to mention how saddened I was to here of the death of Alex Calderwood last week,Â founder of the Ace Hotels. Calderwood did something magical with hotels which very few hoteliers get right. He created spaces where you the visitor felt a sense of belonging. The lobby in the NYC hotel makes you instantly want to plonk down on a sofa, order a coffee andÂ just hang. His hotels aren’tÂ pouncy or uptight, they are pretty near perfect and as simple as those interiors look (like they’ve just been thrown together) believe me when I say they take enormous work. A supremely talented guy, such a sad loss to the industry.